The Endeavor PH1 from Vanguard is the quintessential binocular carrying solution for passionate birders. Designed to offer ultimate ergonomic carrying and quick action viewing. This original system will allow you to discreetly make your way from location to location while never missing a sighting. The protective Pouch is simple and intuitive. It perfectly encases the binoculars within and unfurls half way when in action, to maintain a stable dock. The unique "roll-up, roll-over" protective sleeve makes sure that your binoculars are always protected against knocks, scratches, dust and rain. This sleeve easily rolls out of the way for quick access and instant viewing on-the-go. The ergonomic Harness can be used individually, or combined with the protective Pouch. Using the Harness (with or without the Pouch) will secures your binoculars on your torso, preventing it from bouncing about as you walk, and ideally distributing the weight, thus making it always comfortable to carry your binoculars, especially when out on a long haul. In the Endeavor PH1 you will also discover Vanguard&apos;s meticulous attention to detail. 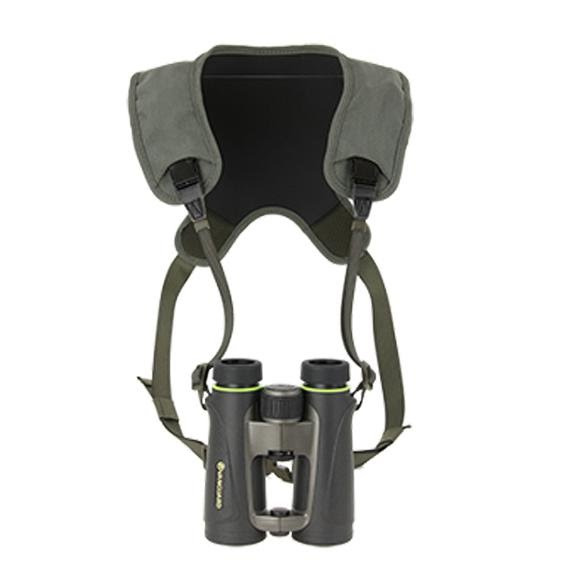 Easy to switch buckles match Vanguard&apos;s Binoculars&apos; Neck Strap allowing easy transition between carrying modes. Small zippered pocket and slip-in pocket are securely nestled under the front sleeve to offer extra storage for lens caps, leans wipe and other essentials. Add to these robust materials and second-to-none quality and we guarantee to make your birdwatching experience a seamless flow, allowing you to always be focused on twitching? and not fidgeting. Dimensions 6 1/8" x 2 3/4" x 7 7/8"